It remains one of my favorite intervals in the whole turning year - the cold sunny days in late winter or early springtime when the north gears up for the maple syrup season. The Lanark woods are full of sugar bird (saw-whet owl) songs, clouds of steam rise from sugar shacks tucked in among the old trees, and the fragrance of boiling maple sap is everywhere. The sylvan alchemy at work is wild and sweet, and the homely metaphor of the cauldron or pot has profound resonance for me. 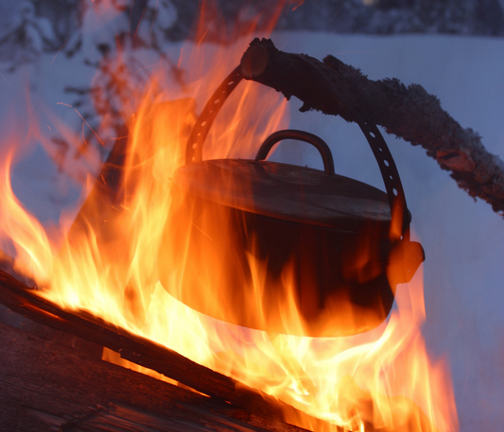 I still have the battered Dutch oven I carried as I rambled the continent many years ago, stirring soups, potions and stews by starlight and watching as sparks went spiraling into the inky sky over the rim of my old pot. The motes of light rising from its depths were stars too, perfect counterpoint to the constellations dancing over my head. These days, there's the stockpot bubbling away on my stove, a rice cooker, a bean crock and an unglazed earthenware tagine, cast iron cooking pots by Staub and Le Creuset in bright red, a small three-legged iron incense bowl on the table in my study. In late February, March and April, there are the sugar camps of friends in the Lanark Highlands, miles of collecting hose in confetti colors strung from maple to maple, evaporators sending fragrant plumes into the air, tin sap pails fixed to trees, antique syrup cauldrons boiling over open fires to demonstrate how maple syrup was made in times past. The word cauldron comes from the Middle English cauderon, thence from the Anglo-Norman caudiere and the Latin caldāria, the latter meaning “cooking pot” and rooted in the adjective calidus meaning warm or “suitable for warming”. At the end of the trail is the Proto-Indo-European (PIE) root kelə meaning simply “warm”. Calendar, calorie, chafe, chiaroscuro, claim, clamor, class, clear, council, hale, haul and lee are kin. So is caldera, the term geologists use to describe the massive crater formed when a volcano's magma chamber is emptied by a massive eruption or the chamber's roof collapses. The largest volcanic caldera on earth is the vast Yellowstone Caldera in northern Wyoming which is actually composed of four overlapping calderas. The night that gifts us with stars and enfolds us gently when the sun goes down is a vast cauldron or bowl. Somewhere in the darkness up there, Cerridwen is stirring her heady cosmic brew of knowledge, creativity and rebirth, her magical kettle simmering over a mystic cook fire. From her vessel, the bard Taliesin once partook of a single drop and awakened into wisdom and song. We're all vessels, and one of the best motifs for this life is surely a pot or cauldron, one battered, dented and well traveled, but useful and happy to be so, bubbling and crackling away in the background (sometimes in the foreground), making happy musics and occasionally sending bright motes up into the air. ... and so it is with this old hen when her favorite wild places begin to awaken. Notions of alchemy bubble away gently; sparks fly upward, images of pots and cauldrons cosmic and domestic whirl about in her thoughts. She simply could not (and would not) be anywhere else. They have said that the one in Yellowstone is still very active and could actually erupt in our lifetime. I would expect it would effect us here only 400-500 miles away with volcanic ash, with the way the jet stream goes. We did get some ash when Mt. St. Helen erupted in Washington State many years ago. Reading your posts all these years with your descriptions of the change of season always brings so much awareness to the cycles of life, and how things change (duh) :) - but my meaning is that it's more evident to me through your descriptive writings here. Can't believe it's time for the sugar run again! This essay is the most magical I have read in a very long time. Thank you for your beautiful words, and Bright Blessings!